We are a leading Service Provider of kailash manas sarovar yatra tours and kailas-manasarover helicopter yatra from Nashik, India. Kathmandu (1300 m.) arrival: Pick up from the airport/ Drive to hotel / Dinner. Kathmandu / : Breakfast, trip to Pashupatinath, Budha Nilkanth temples and back to Hotel for lunch. After lunch, final preparation for yatra. Checking Briefing and demonstration of equipments which will be used during yatra. If anybody needs to buy or get things on hire, our staff will assist you. Drive to Kerung /Nylam : After breakfast leave for Kerung / Nyalam by mini-coach. Walk along for 1 KM to cross the Bridge where all immigration formalities are ought to be accomplished. After all formalities, we proceed to Kerung / Nyalam. Overnight stay at guest house. Rest Day at Kerung / Nylam - It is more a day for acclimatization. New Dongba / 4450m : (Labug-La 5150m, Peku-tso and New Dongba, 382 km) On the first long driving day over the sandy and rocky land of Tibet, other things like lake, nomads chasing thousands of yaks and sheep keep you busy. By afternoon you will cross Bhramhaputra River at Saga. Then proceed for New Dongba for night halt in guest house. Manasarover (4558m) 350 km : The longest driving day starts with full of excitement, Jeeps and trucks roll on the wide valley following rivers and grazing land of yaks and sheep. Far south you can see high peaks nearby you, lots of rocky peaks and sand duns give you an ideal world. Depends on season, nomads and other mobile shopkeepers are attired by beautiful traditional costume, waiting for your arrival with hot tea and other supplies along with big smile. By late afternoon you can have the first sight of Holy Kailash Parbat and Manasarovar. 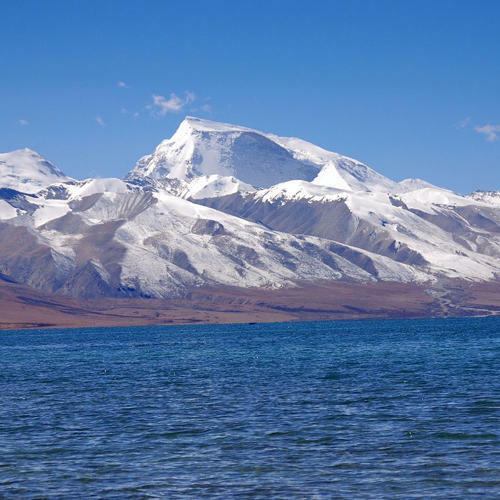 Holy-Manasarovar lies at 14950-ft/ 4558m above sea level. The highest lake of fresh water with turquoise complexion in the world is full of fishes and swans. Holy Kailash Parbat, Mt. Gurula-Mandata, Lake Rashekshi are laying on its surrounding. The region is considered rich for gold and other mines, hot springs and hundreds of wild living creatures. Night halt at Chiu Gompha beside Manasarovar. 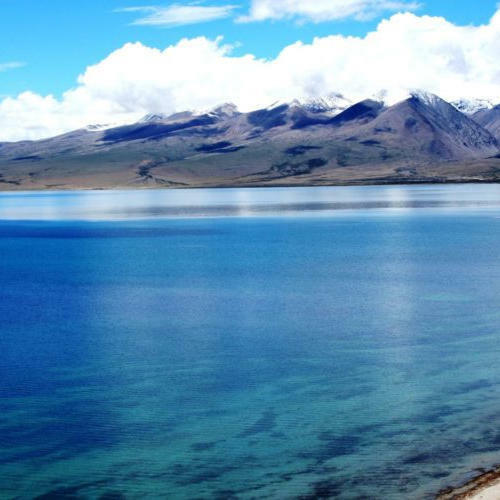 Puja and drive to Darchen (14975ft) 40km : Manasarovara is the lake of compassion, tranquility and bliss. After completing the memorable morning Bath and Puja we will be heading towards Darchen. 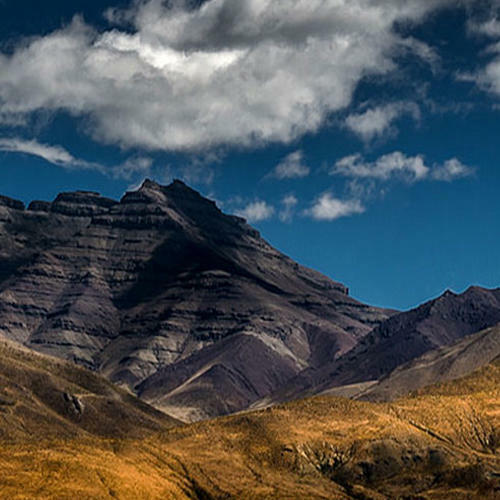 It is considered as a base camp for the Holy Kailash Parikrama. Trek to Dehara Puk/5000m : It is one of the exciting days. Today Holy Kailash Parikrama starts. Reach Yamdwar by bus. Then trek starts. Time to time the face of Kailash Parbat will walking along the beautiful rocky cliffs; waterfalls with some clouds in the clear blue sky make you feeling that Great God Shiva is everywhere with tons of blessing to you. Be keep on reaching Dehara puk. For 11 km trail it takes almost 7 hrs. Arrival at Lucknow Airport / Railway Station. Pick up and Drive to Nepalgunj, Overnight at Siddhartha Hotel (200 km). After Breakfast fly to Simikot by domestic airlines. (55 minute) 2900m. then continues fly to Hilsa by Helicoptor (20Minutes), cross Nepali Border (Shera Border) then we have to walk 10 minutes and cross the China Border and enter to Tibet. Meet our Tibetian and Nepali crew and drive to Taklakot-Purang (3900m) 30km. Over night Hotel. Full day rest in Purang (Takalkot) for acclimatization. Overnight Hotel. Drive to Holy Lake Mansarovar. Do Mansarovar circuit parikrama by bus. (4500 M-78 km) and rest of day perform free spiritual activites such as the abode of god will be a lifetime acheivement. Perform Pooja, Havan worship, meditation, holy bath etc. O/n stay guest house Chiu Gompha, beside the shore of Lake Mansarovar. Manasarovar to Darchen 30km. (4560 m) (After breakfast drive for Darchen the base camp of Holy Mt. Kailash. Then Darchen to drive 10km to Tarboche (Yamdwar). Trek Parikarma/Cora begins from Yamdwara and walk approximately about 06 hour for Dirapuk (4890m) Overnight stays at Guest House. Trek to Zuthulphuk (4790m) 22km. walk approximately 10 hours Parikarma Continues, this is the most difficult journey throughout the trip, Trek up to Dolma La pass(5600m). Please perform very very short prayers/pooja at Dolmala and move towards Gaurikund. Them drive to Zuthulphuk O/N stay at Guest house. Zuthulphuk to Taklakot / Hilsa via Manasarovar Lake. After Breakfast, trek upto Chongdo 3/4 Hour walking & drive to Darchen, Parikarma ends. Drive to Hilsa Via Purang O/N at Guest house. After breakfast fly to Simikot by Helicopter and back to Nepalgunj by flight from Simikot O/N at hotel. Departure transfer to Lucknow for your onward journey. Looking for “Kailash Manas Sarovar Yatra Tours”?